This was my very first strawberry pie. I mean, I’ve had the sort of semi-homemade cafeteria icebox strawberry pie where you mix halved strawberries with jello and top it with some sort of non-dairy whipped topping affair, and yeah, that’s ok. But a pie with cooked strawberries? You just never see them do you? I always assumed it was because cooked strawberries in a pie just weren’t that great- that they should really be kept bright and fresh. Boy, was that wrong! I’m here to tell you that strawberry pie is amazing. I’m going to spend the rest of my life making strawberry pies! The strawberry flavor intensifies, but they keep their beautiful bright red luster. And this fluffy crust, brushed with egg yolk and sprinkled with sugar is very much like a great strawberry shortcake biscuit. It’s a juicy pie, but it’ll still slice pretty cleanly, and the juice will be more like a lovely little pool to drag your fork through after you’ve finished your slice than a messy nuisance. This recipe is adapted only slightly from Joy the Baker’s recipe, which calls for freshly grated ginger in the filling. Don’t skip this! I thought about omitting it because it seemed a little fussy, but the ginger flavor just goes perfectly with the strawberries and keeps it from being too sweet and simple. Oh yeah, and this is my April pie Please pretend it’s not already May. In a medium bowl, whisk together flour, sugar, and salt. Add cold, cubed butter and, using your fingers or a pastry knife, work the butter into the flour mixture. Quickly break the butter down into the flour mixture, some butter pieces will be the size of oat flakes, some will be the size of peas. In a small bowl, stir together the egg and coconut milk/lemon juice mixture. Create a well in the butter and flour mixture and pour in the liquid mixture. Use a fork to bring to dough together. Try to moisten all of the flour bits. On a lightly floured work surface, dump out the dough mixture. It will be moist and shaggy. Sprinkle generously with flour. Shape dough into two disks and wrap in plastic wrap. Allow dough to rest in the fridge for 1 hour. Dough is easiest to roll out when it’s cold and rested. Toss together strawberries, sugar, tapioca starch, lemon juice, salt, nutmeg, and ginger. Toss until all ingredients are well coated. Allow mixture to rest in the fridge while you roll out the pie crust. When you’re ready to roll out the crust, on a well-floured work surface, gently roll out the pie crust into about an 11-inch circle. Press together any spots that might tear. Carefully lift down and place into the 9-inch pie plate. Use a pairing knife to trim the edges of pie dough, leaving about 1/2 inch extra dough overhang. Fill pie plate with strawberry filling. Brush edges of the pie dough with a bit of water. Repeat the dough rolling process and carefully place second crust on top of filled pie dough. Trim edges to 1/2-inch overhang. Fold the excess dough under and crimp with fingers, pressing together. 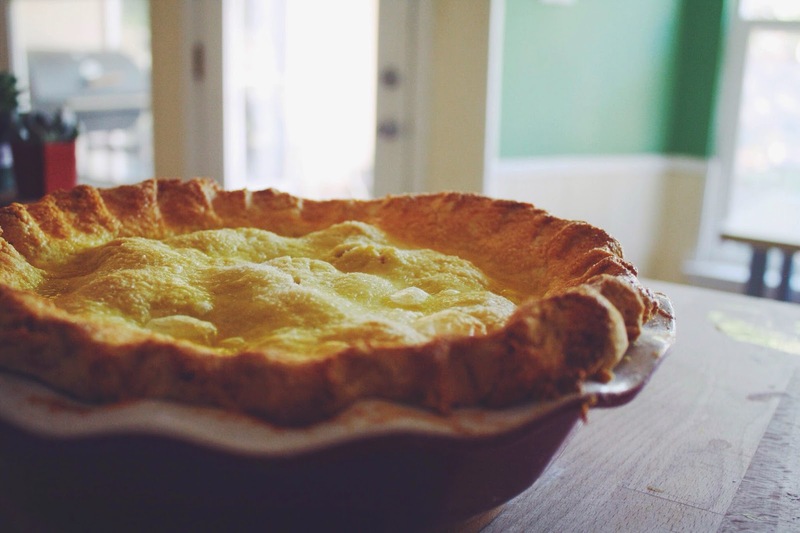 Brush top of pie with beaten egg. Sprinkle generously with granulated sugar. Cut 4 small vent holes in the top of the pie. Place pie on prepared baking pan and place in the oven. Bake on 425 degrees F for 10 minutes. Reduce oven temperature to 350 degrees F and bake for 30-55 minutes (mine took a lot longer than the original recipe called for) or until crust is a gorgeous golden brown, and the juices are bubbling from the pie. Remove from the oven and allow pie to cool to room temperature before slicing. Yum! I shall make one. Always say YES to Ginger – I know we do! Haha!